The three-dimensional graphics accelerator or graphics card, may be built into the motherboard. Often used external video cards that do not need to do any settings in the system. But for the built in option to fine-tune. To configure the BIOS in the graphics card, you will need a minimum knowledge of the English language and the ability to navigate the text menus. Turn on your computer or restart it. This is necessary in order to enter the BIOS system. Click to enter the configuration of your basic system input and output. To do this, after power-up press the DEL key — in many cases using this method of activation. Some manufacturers use a different method, F2 or F10. Press several times to not miss the right moment in the boot process. If done correctly, you will see the BIOS screen, designed in bright colors of white and blue colors. While the top row lists the names of the categories that you can configure. Or a window with two columns of names of groups of settings on a dark blue background. It depends on the manufacturer of the BIOS firmware on your motherboard. Locate and select the menu item with the word Chipset. There are various options, for example, or Chipset settings advanced chipset settings. In blue and white BIOS, you must first select the tab Advanced menu and activate the required row. To navigate through the settings use the arrows directions on the keyboard. Used to select the Enter key. That is when you select something in the script and pressed Enter, you find yourself in a submenu with a list of options or actions. And pressing Enter in the string setup, you get the possibility to change the value — this is the video configuration in the BIOS. Select the menu option responsible for the size of video memory. It is usually called Graphics Aperture Size, AGP Aperture Size or shared memory. Specify the largest possible number from the available list to the selection, for example, 256 MB or 512 MB. This will allow the video card to work with the specified amount of memory and speed up the work of the graphics subsystem. Keep in mind that the used memory. If you have less than one Gigabyte, then at higher values of memory, the computer may slow down. Save the settings on the card that you made. To do this, press Esc and select EXIT. Find the line that says "Save Changes" and press Enter. A message appears with the request to confirm or cancel saving: press Y, the computer will close the BIOS and restart. 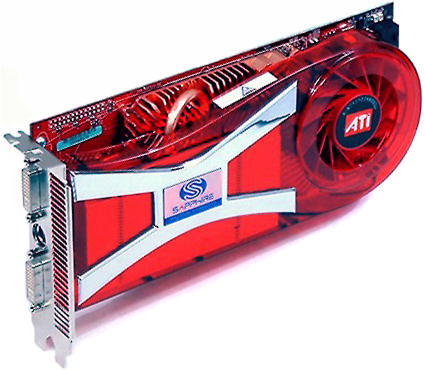 Modern models are sold with graphics cards. Some of them are weaker, some stronger. But there can be a situation when you need to disable the graphics card. This can be done in different ways, and each case requires a special approach. The easiest way to implement it through the system BIOS. To do this, follow some step-by-step. During restart the laptop press "Del" or "F2". Opens BIOS. Look in the menu section such as "Integrated Peripherals" and select "Integrated Video" or "Integrated Peripherals". Set the options "Disable" or "Off". You can disable in the BIOS and in the following manner. Go to the "Advenced Chipset Features". Look for "Boot Graphics Priori". Instead of the value "PCI" insert “PCIIGD”. You can try to make and other methods. In Windows, delete the driver for the video card. Then restart the computer. The card should then turn off immediately. Go to your laptop BIOS. Scroll to the "Integrated...". Open the settings for "Init Display First". Put it to “PEx” instead of the value of “Onboard VGA”. Save these settings and again restart the laptop. Go into the BIOS. Locate the "Advanced" tab. Next look for the option "chipset". Click on the tab "Primary Video Controller". Disable “GFXO-GPP-IGFX-PCI” or “IGFX-GFXO-GPP-PC”. Then hit “F10” to save the settings. Start the registry editor. Go to "Win+R" and then click "regedit". Click "OK". Open HKEY_LOCAL_MACHINESOFTWAREATITechnologiescds000memory”. Change the value of "hypermemory" , changing it to "0". If for some reason this branch is not present, create it manually. Download and install the utility “Tools & Options”. On the Internet this utility is distributed free of charge. Installation problems will not arise. Start it. Go to the option "General Options" and select "Advanced". On the value of the "Enable ATT Shared Memory" to remove the check. If you have the operating system Windows7, go to "control Panel". Select "device Manager". Next, go to the tab "Adapter" and perform all necessary shutdown. If you install an additional video card instead of integrated devices there is a need to disable the integrated video card. 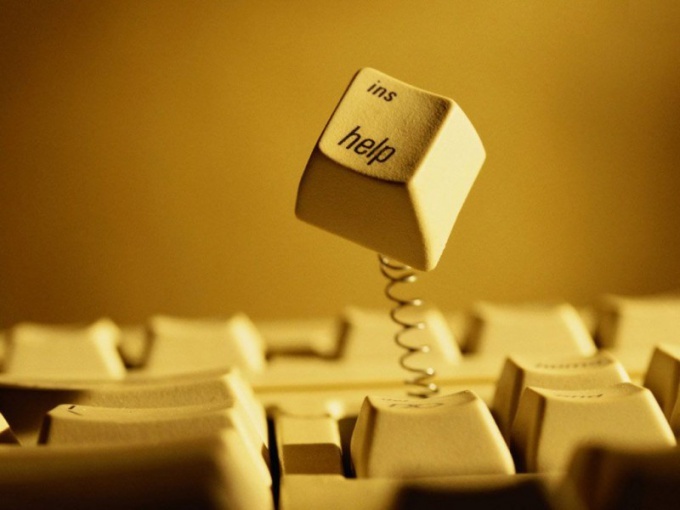 In most cases, you will need to configure the BIOS, which can be performed without the involvement of specialists. After installing a new graphics card into the appropriate slot of the motherboard, turn on the computer. It is not excluded that the new device will be automatically activated, and a built-in adapter disabled. To check which graphics card is active, go to the Windows control panel. Under "display Adapters" dialog box "device Manager" will be displayed and the video card running at the moment. If the device is an integrated video adapter that is not disabled automatically, restart the computer and after turning it on hold down the Delete key (Del) to enter BIOS menu. On some computers the access control of the underlying operating system occurs after pressing one of the function keys (F2-F10). The desired key can be determined by trial and error or to clarify the information in the user manual of the motherboard, and if you have a portable device – in the user manual. In the BIOS, find the section Integrated (or Оnboard) Video (integrated video card) in menu Integrated Peripherals. Disconnect the device by selecting Off instead of On, or Disabled instead of Enabled. Complete the BIOS by pressing F10 key (Save and exit). After loading Windows, open "device Manager" and check the changes made in the settings of the adapters. On some motherboards to force disable the integrated devices (sound, video), you must switch the so-called jumpers. Their location should be specified in the instructions to the motherboard. Improper installation of the jumpers may lead to the impossibility of turning on the computer, so do not attempt to move the jumpers at random. Installing a new graphics card, don't forget to connect the VGA cable. In certain models of mobile computers used two graphics cards. One of them is the graphics chip integrated into the motherboard. To switch adapters, you can use various utilities. First, try switching the priority of the display adapters using the BIOS menus. Turn on your computer and press the desired function key. Most often the name specified during initial startup menu. Click Advanced Setup or Video Options. Look for Primary Video. Press Enter and select the video card. This files most often initially actively integrated device. If the item is missing, locate the menu Video PciEx. 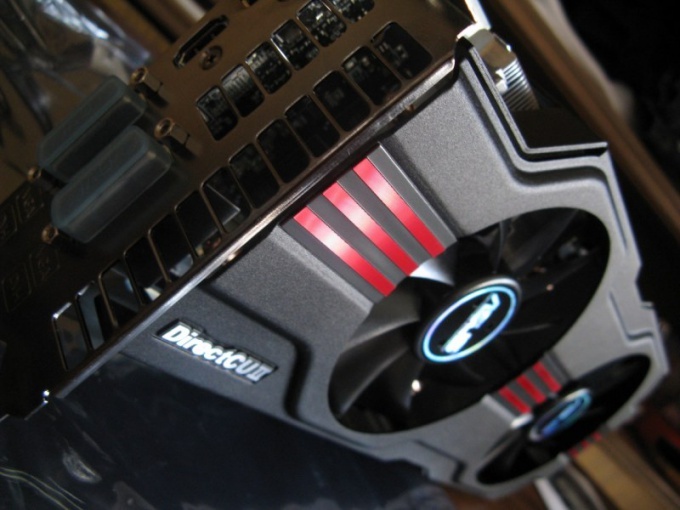 It will display all the characteristics of a discrete graphics card. Install for this device priority activity, moving it to the first position. Go to the start menu screen BIOS. Save the changes and restart the computer. It is worth noting that some models of mobile computers originally start it is the integrated adapter. Turn them off in the BIOS can lead to lack of image. To simplify the work with graphics cards, there are special utilities. 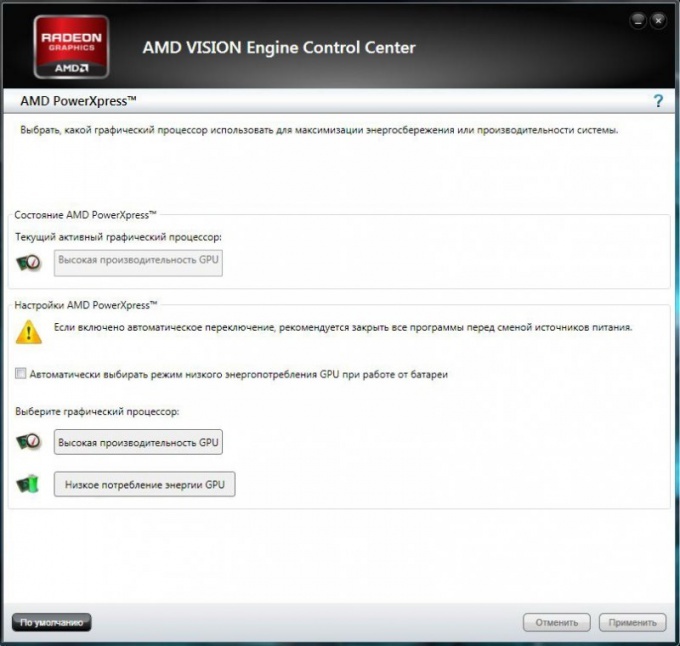 If your computer have a discrete card ATI (Radeon), then install together with the driver program ADM Power Xpress. Launch it and click in the box that appears the item "High (low) performance of the GPU." Wait for the change of video card. If your laptop uses a combination of Intel and nVidia, the switching will happen automatically. Just run the powerful application, for example, a game with three-dimensional graphics. The system will automatically replace the video card priority. For independently switching video cards install nVidia Hybrid Power. Most often, this utility can be found on the website of the manufacturer of the mobile computer. Utility for some models are also available on the website www.nvidia.com.